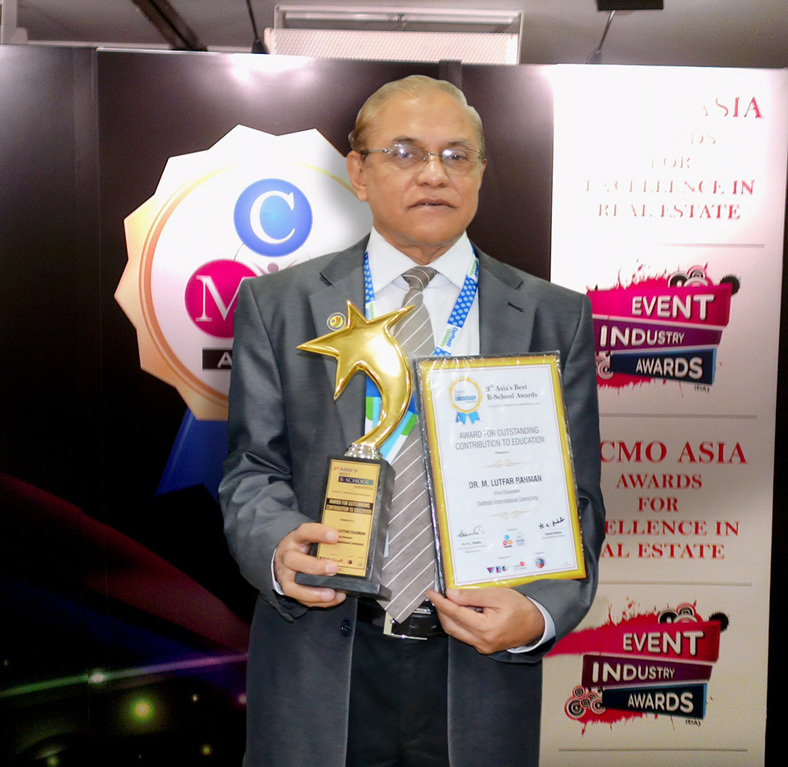 Daffodil International University achieved Asia’s Best B- School Award and its three high officials were awarded 3rd CMO Asia Awards for Excellence in Branding and Marketing. Daffodil International University is the only educational institution in Bangladesh who achieved this award. The Awards are hosted by World Brand Congress and World CSR Day and was presented at the glittering ceremony on 19th July 2012 held at PARK Royal on Kitchener Road, Singapore. Daffodil International University achieved the Awards in three individual categories for its outstanding performance in Academic activities and quality education. Professor Dr. M. Lutfar Rahman, Vice Chancellor, Daffodil International University achieved the Award for outstanding contribution to Education. Professor Rafiqul Islam,Dean, Faculty of Business and Economics of Daffodil International University achieved the Education Leadership Award and Professor Dr. Syed Akter Hossain, Head, CSE of DIU achieved the Award for Best Professor in Information Technology. The Asia’s Best B-School Awards are presented by World Education Congress, CMO Asia with CMO (Chief Marketing Officer) Council as its strategic partner and stars of the industry Group Individuals and Institutions who have surpassed several levels of its excellence and set an example of being role model and exemplary leadership. Individuals behind the institution who are building their institutions through Leadership, Innovation, Academic and Industry Interface and a Supreme objective of building future leaders. An independent Jury comprising of Senior Professionals from Marketing, Branding, Advertising, Public Relations, Brand Strategy and Corporate Communications judged the entries. The Ceremony was attended by companies from 40 countries of Asia, together with leaders from different business fields, professionals from the worlds of economics, the arts and corporate image, quality experts, as well as academic personalities and representatives from the diplomatic corps took part in the CMO Asia.